Is there anything more adorable than a baby with dimples? 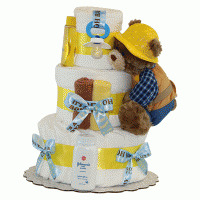 Definitely not - but the Baby Dimples diaper cake comes close! 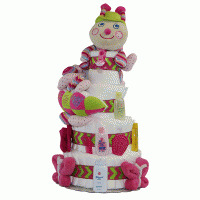 This precious little cake is guaranteed to put a smile on the face of mom AND baby (let's see those dimples!) Includes our signature "washcloth cupcakes" - made from FULLY USABLE washcloths and baby socks...sweet! Availability: Usually leaves our facility in 2 business days or less. Need it fast? View our Rush Options. 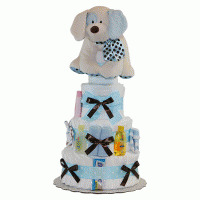 This diaper cake will arrive beautifully gift-wrapped in sheer white tulle.